I've long been a vinyl-phile since I was a kid (now 51). I've got a few thousand records, some are over 40 years old that I bought as a kid and still sound great!. I also run a linux based (vortex box distro) Squeezebox server with about 5,000 FLAC albums. Over 1.5 tb of files! I'm not a luddite, I just enjoy the sound and experience of vinyl. I recently upgraded to a Dynavector DV-20x2 which has an output of only 0.3 mv. Previously, I had been using a medium output (0.9 mv) Benz Glider on my stock VPI scout turntable into an Emotiva USP-1. After setup and taking time to assess the new cartridge, I started to wonder if I could improve things. My main assessment of the DV-20x2 into the USP-1 was that the sound was okay but maybe lacking in extension on both the low end and high end frequencies. I was especially concerned that I was not retrieving all the high end information I knew to be on the recordings I was very familiar with. After further research, I decided to try a SUT (Step Up Transformer) and chose the $395 Cinemag 3440A model from Bob's Devices. I consulted by email with Bob about my exact setup and which of his devices would be recommended. A quick PayPal transaction ensued and less than a week later I had this little magic box in my hands. Paying close attention to cable layout using my own custom cables (Gotham GAC-4/1)with the shield attached only at the source end only (as recommended by Bob) resulted in a very quiet installation with no evident hum whatsoever. Only a small amount of hiss is evident but inevitable when dealing with such minuscule voltages. 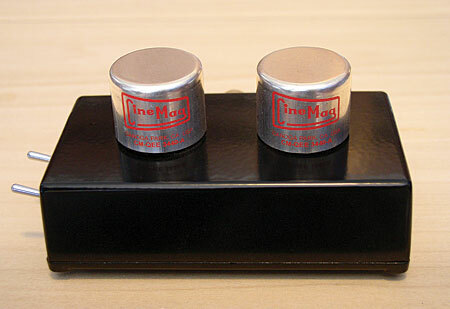 In case it is not obvious, the purpose of the SUT is to magnify the gain from the cartridge to a sufficient level to drive the moving magnet stage of a preamp. The SUT I bought features a 10x and 16x option and it was recommended I use the 10x selection. The positive change the SUT brought to my vinyl playback chain was very dramatic to say the least. All reservations I had before were erased and my records now had the frequency extension and dynamic impact I longed for and expected. Some may say that spending an additional $400 for a device attached to a $400 preamp is a lopsided expenditure. All I can say is my vinyl now sounds exceptional and I can't stop listening. You can read all about Bob's Devices here. Also, there was a good write-up not too long ago in Stereophile. One other advantage for using a SUT is that the MM specification seems to be more standardized which I think my contribute to the quality of what I am hearing. I gather MC stages are less standardized and thus more susceptible to sound variations like I experienced. I surmise that when dealing with such low voltages, that cartridge loading (100 ohm, 1k ohm, 47k ohm) becomes ever more critical. So, for those of you that continue to explore the vinyl world and have ventured into using low output MC cartridges, you may want to add a SUT device like Bob's Devices to your toolbox. Last night, I attended a wonderful concert at the Strathmore Music Center. Marin Alsop led the BSO in a sampler concert featuring excerpts of works that will be played during the forthcoming 2011-12 season. Highlights for me included a sublime Afternoon of a Faun by Debussy. Alsop provided informative program notes before each piece and pointed out the scandalous for the time “Devil’s Triad” of notes. I was also thrilled to hear the powerful Thus Sprach Zarathustra also known as the theme from the Stanley Kubrick movie 2001 A Space Odyssey. The opening Fanfare for the Common Man by Copland was very powerful and moving as was his theme from Appalachian Spring. Is there any more quintessential American Music? The BSO under Ms. Alsop’s direction was in top form and based on the smiles on their faces seemed to be thoroughly enjoying themselves!